Fi, my dear friend for many years, has done a remarkable journey of transformation that has taken both extreme courage and Divine grace. It has been a most beautiful gift to watch her go within her cave, meet her deepest sorrows and pain, linger there with Healing Love, and return with glorious risen life and even JOY which speaks louder than any sermon could ever preach. I am thrilled, inspired, and grateful far beyond words to journey with her and to share a piece of her story here. It’s worth the descent. I invite you to be still with this magnificent sketch by David Hayward. Sophia at the entrance is us. Dare we go in to the depths of our souls – what will we find there? or who? What I share with you today began with this picture called The Cave. 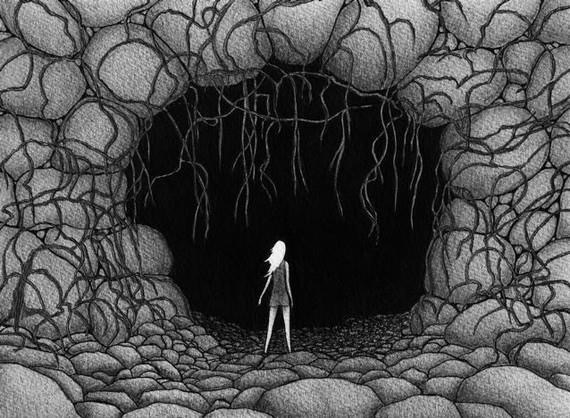 It is a drawing by David Hayward of a young woman, standing at the entrance to a dark cave. She knows this cave is a part of her very self, and she is arguing with herself about whether to take a look inside. To me this picture is a call to acknowledging and embracing all that is hidden in us that we’d prefer to hide or forget. It is a call to mature, and to become all that we can. How can we ever be fully loved, if we are never fully known? And how can we ever truly love ourselves if we do not actually know ourselves? I think there are seasons of our lives when we need to get to know ourselves better or we simply will not mature. Part of this will mean going into our cave; daring to peek into the dark places of our thoughts, emotions and past. My personal discovery has been that the more I know myself, the more I know God. Risking getting closer to myself has been an unexpected gateway to getting closer to God. The more I have embraced all that is hidden in my dark, hidden self, the more I have discovered the Light of the Creator within me. He was waiting for me in the cave. When you look at David Hayward’s picture, and you imagine it as a place inside of us, what do you think might be hidden in that cave? This is my list: depression, mental illness, sexual orientation, addictions, fears, past hurts and traumas, our failings, things we can’t forgive, parts of ourselves we despise or are ashamed of, our deep losses, all our triggers and soap boxes. I think that for me and for many people, what was hidden in the cave, had become my enemy within. This hidden stuff limited me, tripped me up, stopped me being who I wanted to be. It frustrated and annoyed me. At times I loathed my inner me. Jesus had a very simple solution for dealing with our enemy. Love. Learning to Love ourselves can be the epitome of Loving our enemy. And therefore, should we ever decide to enter our cave we have to make a decision to be clothed only in Love. We cannot go in there to drive out the darkness; all guns blazing, tongue lashing, fingers pointing. Remember, the cave usually holds pain, trauma, shame. To enter, it is very important that we first lay down our self-accusations, our control, our “why don’t you just grow up!” our “I can fix this!” and our self-pity. Our caves contain that within us which feels unreachable, inaccessible and untouchable. Parts of ourselves which we cannot change. Not by prayer and tears, nor by monumental human effort. I have a mystery for you. Love is the key to transformation. Always. Love changes us. I cannot explain it, but those out-of-reach parts of me which God and I have embraced and loved are becoming healed and are becoming a gift to me; even the ugliest and vilest of them. I have been thrilled to discover that the more we are transformed by Love, the more we become ourselves. The more I give God’s love freedom in my cave, the less of my junk there is and the more of Fi I discover. Letting God teach me how to love myself hasn’t shrunk me, it has expanded and enlarged me! And that makes me better at loving others. It turns out … the treasure hidden in my cave is me! And the treasure hidden in your cave is you! I have visited my cave for 10 years now. It is no longer such a scary place for me. This last couple of months I have struggled with anxiety and fear to some degree every day. But now I know to go into my cave (where I hide these emotions) with compassion and wrap my arms around my fearful self, to let her rest her head on my shoulder and to hold her shaking hand. I don’t tell her she can do better, I don’t beat her over the head with scriptures, I don’t rebuke her for her lack of faith and trust, and I don’t pretend she’s not there and stuff her down into the darkness … instead I look her in the eye and I say “we’re going to get through this together Sweet Fi, God will give us wisdom and courage for all that’s coming.” And I have spread my nets out among my trusted friends and asked for opportunities for my fearful self to have her voice heard over cups of tea and walks through the woods – they too will be with me through all that is coming. This way, even my darkness is held by God, my community and myself. And to you, dear friends, I wish you courage on your journey. And should you ever find yourself looking into the dark abyss of your own heart and wondering if you dare proceed … I say, take courage. The Light of the Creator awaits you inside. Strip off your garments of accusation and blame. Clothe yourselves in Love, and tip-toe in gently and humbly. You will be led. He will light your path. And you, just like Jesus of Nazareth, will experience the transforming power and wonder of Resurrection Love in the cave.